We have a tradition when camping… oops, I mean glamping. My mother in law and I trade off on making meals each night (cuts down on the effort and dishes) and each of us makes one breakfast. Typically I will make soyrizo and eggs, however on this trip there was no soyrizo at the grocery store (horror!) and I was too busy to go to another store just for that. So we headed up the mountain with a dozen eggs and not a clue of what to make. Three days in, I had a brainstorm. I had eggs. Butter. Ham. Bread. What would you do? I suspect most wouldn’t take it on, but I needed a challenge. And a challenge I got. It’s actually not that hard, just takes two pots, one pan and one small metal bowl, and I’ve got a tip to make it easier. At the end of breakfast, my father in law exclaimed “That’s the best Eggs Benedict I’ve ever had!” (Admittedly it was the first he’d had… but I’ll accept the compliment just the same.) I may have just started a new tradition! So, if you’re in need of breakfast, or a glamping challenge I do hope you’ll give this a try. You won’t be disappointed, and you’re sure to delight your in laws. First, make the hollandaise and set aside. Next, toast the bread in a frying pan and set aside. If you have an oven, keep it warm in a 300 degree oven. In the same pan, heat the ham slices on high until it gets slightly browned. Set aside in the oven or under a plate. In the same pan, brown the zucchini over high heat until brown on both sides but still firm. To assemble, place the toast on a plate, top with ham, then zucchini, then a poached egg, two spoonfuls of Hollandaise and sprinkle with green onions. In a medium metal bowl, combine yolks, lime juice, cayenne and salt. Whisk to combine. Heat a small pot of water and place the bowl over the water. Continually whisking, drizzle in the butter gradually. After about 1-2minutes the sauce will thicken. Remove from the heat immediately and keep whisking for another minute to stop the cooking. Viola! Hollandaise! (*) Poaching eggs intimidates me. I have never mastered the whole vinegar in the water whirlpool thing. So I cheat. In a small bowl, place a square of plastic wrapa and spray the plastic with cooking spray (like Pam). Crack an egg into the plastic wrap (you can add one of those whites you saved for a little extra bonus) and twist like a little bundle. Repeat for all eggs. Boil water in a large pot with about 2-3 inches of water in the bottom. One boiling, gently place the eggs in the water, with the top of the bundle sticking up. 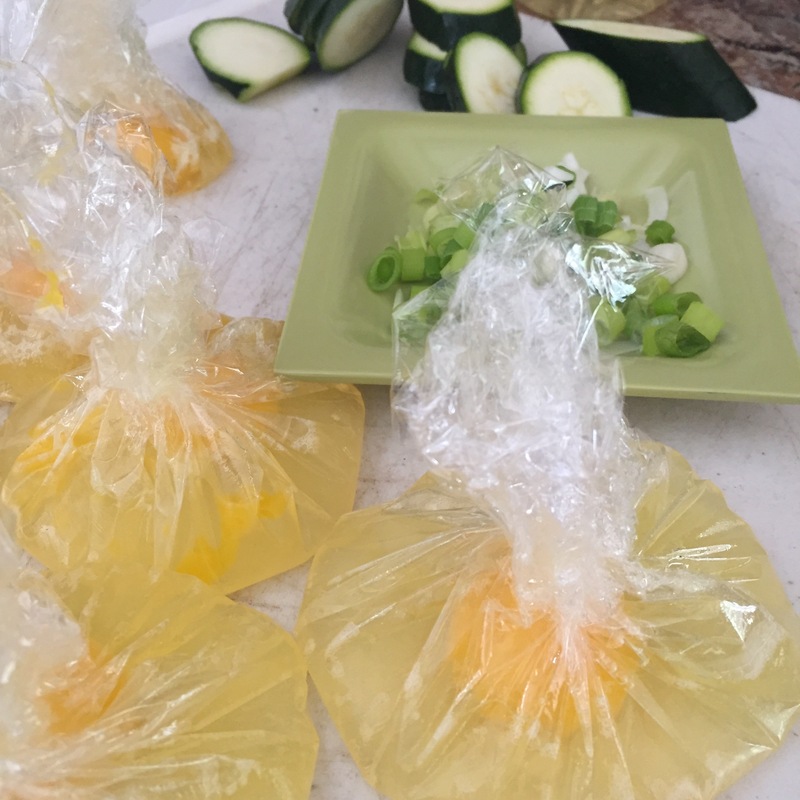 After about 1-2 minutes the whites will begin to whiten and this is when you can hold the top of the plastic, snip open the package and gently shake the egg into the water to finish cooking for another 1-2 minutes. Remove from the water with a slotted spoon.